We are very pleased to have our own 25m heated indoor pool at Rossall. Used by Rossall and other local schools during term time, it is used widely for beginners, more advanced swimmers and swim squad alike. It is also used for other pursuits such as canoeing, scuba diving and water polo. Out of school hours, the pool is also made available for community use with a number of public swimming sessions and pool hire options. Rossall Swim School Swimming Lessons run Sunday’s between 09.30-14.00 throughout the year. Everybody is welcome, from non swimmers to pre-club standard. We provide children’s swimming lessons all year round including school holidays, in our very own private 25m indoor heated swimming pool. Constant monitoring of pupil progress and on going communication between teachers, parents and swimmers. Great value for money—£75 for a course of 10 (Ten) lessons plus 2 (Two) Free lessons! Price also includes all certificates gained in a course so there are no additional fee’s. That’s just £7.50 per 30 minute lesson (per child, per week) and 12 weeks for the price of 10, and includes certificates! FREE car parking for all pool users in the short stay car park next to the Astro turf pitches accessed via main drive. Please note the public family swim is no longer available on Sunday’s. Rossall School’s Swimming Pool welcomes families every Saturday between 11.30am – 2.00pm for a family friendly swimming session. The cost is just £5 per family (up to 4 people), with free parking. We have a strict child admissions policy in place that must be adhered to at all times during the family swim sessions open to the public. Please see the child admissions policy for more details. * Please note: Swimming lessons take place at the same time as the family swim and only half of the pool will be available for use. Please bring armbands with you for younger children. 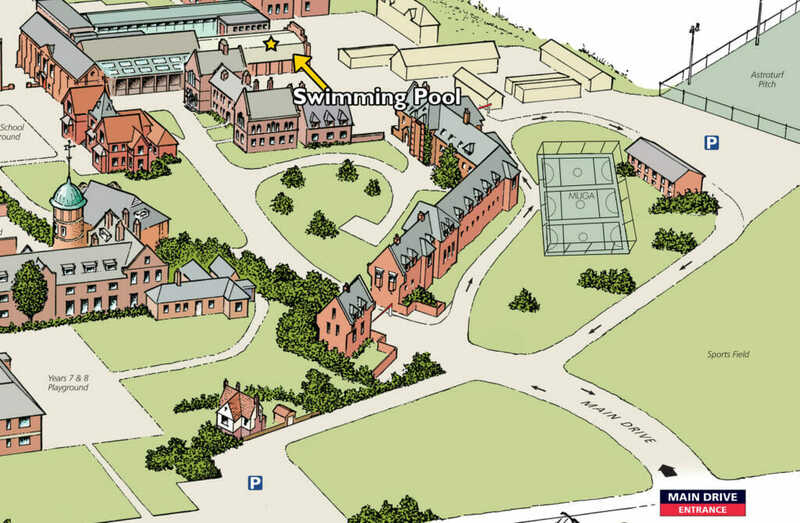 Rossall School’s Swimming Pool holds adult swimming lane sessions every Monday and Wednesday evening from 7.30pm – 8.30pm. The price is just £3 per adult and includes free parking. Sign up for one of our loyalty cards and your 11th swim is free! The cost of this is just £13 per child with a minimum of 10 children and a maximum of 30. We also require 1 adult for every 10 children. We have a strict child admissions policy in place that must be adhered to at all times during children’s parties open to the public. Please see the child admissions policy for more details. A number of our beautiful buildings and facilities are available for hire during holidays and term time. Sport is seen as a key part of the Rossall all-rounder, a pupil who is competent in all areas of the curriculum, academically sound, emotionally intelligent and physically fit. Useful details and contact information to enable you to connect with Rossall.